Yes, this is a DNA post. Your calendar is just fine. But hey… it’s a sale. And every day counts when it comes to saving money on DNA tests, right? 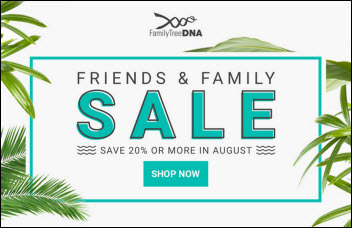 So… it’s Christmas in August again, with the summer sale on all kinds of tests from Family Tree DNA. Every key test we might want to use for genealogical research is on sale right now. • The Family Finder test is on sale for $69, plus shipping, down from the usual $89. Anyone, male or female, can do this testing. • The mitochondrial DNA (mtDNA) Full Sequence test is on sale for $159, down from the regular $199. Again, anyone, male or female, can do this testing. • The YDNA Y-37 test is on sale for $139, down from the regular $169. Because only males have the Y chromosome, only males can take this test (ladies: recruit your brothers, uncles, male cousins! ), and this one is an excellent entry-level test. Some of these tests — the YDNA and mtDNA tests — are only available at Family Tree DNA if you want to be able to use the results in a meaningful way for genealogy. The autosomal test, Family Finder at Family Tree DNA, is the same kind of test that’s offered by AncestryDNA, 23andMe and others, but it has some real advantages in the DNA testing world. One key feature is the ability to separate matches into the paternal and maternal sides solely on the basis of the DNA results. Other testing companies won’t do this without having a parent tested in the database — an insurmountable hurdle for those of us whose parents have passed on. Family Tree DNA, however, will divide the matches based on siblings, cousins, aunts and uncles and more. This new matching system alone makes it well worth being in the Family Tree DNA system, even if you’ve already tested elsewhere. Besides… if you buy it now, it’s cheap! You gotta love these sales.